Lectures by Morton Herskowitz, James DeMeo, Conny Huthsteiner, Philip Bennett, Wendy Kohli, Peter Robbins, Stephen Simonian, Armando Vecchietti, Renate Reich Moise, Roberto Maglione, Hugh Brenner, Peter Jones, Jorgos Kavouras and Tina Lindemann. Lectures will be in English and Italian, with translations. PLEASE REGISTER AND MAKE YOUR OVERNIGHT ACCOMMODATIONS AS EARLY AS POSSIBLE. All the basic information we currently have is posted to this webpage, and to the linked web pages provided above. Life has been busy at our mountain laboratory, where so far we’ve had the 2nd greatest snowfall since the OBRL facility was constructed starting back in 1994. More snow on the way over February, March and April, at least, by the climatological expectations. Meanwhile I’ve provided links below for a number of articles and reports on the global climate situation. But there are a few more commercial and scholarly items of merit deserving attention. There is a very good DVD item from History Channel, titled The Little Ice Age: Big Chill (LIA). It is one of the more accurate climate documentaries I’ve seen. It was made in 2005, but for reasons of probable political correctness, was not announced to the public until most recently. It doesn’t even have a fancy cover, and when you see it, you’ll realize the reason is because it down-plays the global CO2 warming hysteria with interviews and documentation on the very real nature of the LIA. For those who study authentic climate science, there’s nothing particularly new in it, other than the film crew actually travelling to various world regions and showing things which document the LIA as a real phenomenon of past centuries, in addition to the various interviews with climatologists most won’t recognize — because they aren’t from the popularity crowd of the "warmer" camp. The video does toss a bone to the warmers near the end, but correctly present the warming theory as one of many possibilities, without necessarily tying any warming to a rise in CO2. They also discuss the Medieval Warm Period (MWP) which supports the idea that the current warming trend is the consequence of natural cycles. The more ruthless of the climate science pretenders, as at the IPCC and Wikipedia, have done their best to erase or minimize the MWP and LIA, as they stand as a stark testament to pre-Industrial warming and then a plunge into chilly climate, that cannot be the consequence of industrial CO2, and help us to understand that the current warming cycle which began around 1750 is merely the expression of a gradual warming from the colder conditions of the LIA. The reality is, we’ve had climate periods warmer than today, and cooler than today, but for human history we have not yet gone back into the full deep-freeze similar to the old Pleistocene glacial epoch. That Really Big Chill will happen eventually, sure as snow, but nobody is too sure about when, and until it does happen we will experience smaller oscillations of climate. Climates change. That was known well before the politically-motivated factions of "climate science" began to misappropriate the term for their own agendas. And also to monopolize funding for climate research, which makes them "popular" among the media types. Anyhow, my recommendation is to get that DVD and self-education, then share around. I’ve provided the links where it can be purchased on Amazon.com but possibly you can find it elsewhere. Jean Grove: The Little Ice Age – by one of the world’s top scholars on the subject. 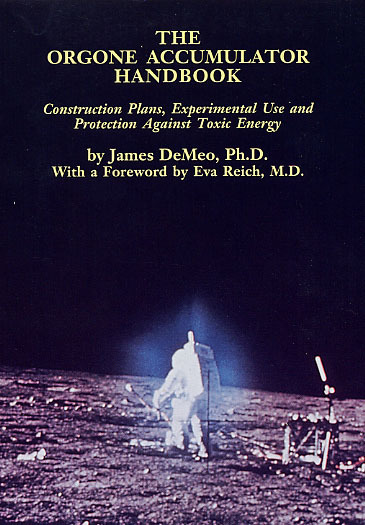 This one is a bit pricey, but no more than many college textbooks, and should be in the library of any professional concerned with the climate issues. Brian Fagan: The Little Ice Age – Another scholarly but more readable overview on the horrific conditions of the LIA – crop failures, famine, starvation, economic decline, wars, epidemic diseases, turbulent oceans blocking exploration. Brian Fagan: The Great Warming: Climate Change and the Rise and Fall of Civilization. This one details the MWP, which was a time of long summers, bountiful crops, great economic boom and ocean voyages of exploration. Below I give some additional notes from recent news reports, of major chills and snows of this season. Recap: Is the “Big Chill” On? Coldest Air of the Season? File these next ones under: "Climate Scientists are Not Infallible"
2013 will be a busy year at the Orgone Biophysical Research lab (OBRL). 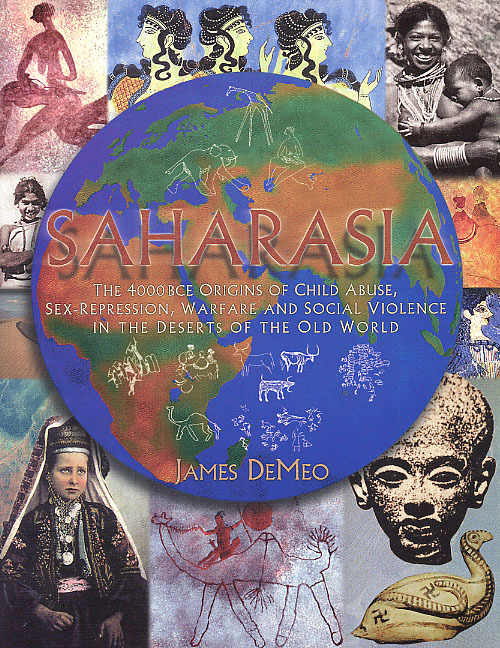 Aside from research activity and writing, with a new book in process (see below), I’ve been invited to give lectures at conferences or universities both in the USA and internationally. A special weekend Seminar may also be organized at OBRL. More details will be posted up as we learn them. This title will be available hopefully by April, and will be announced via the OBRL News emails and blog. 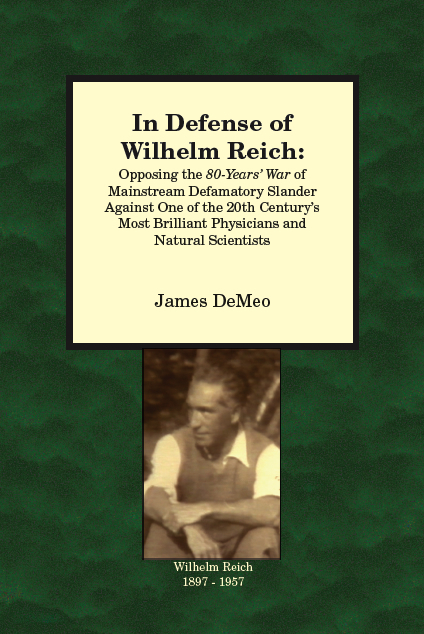 The "et al" includes a list of 24 professional scientists and scholars from around the world, a resounding affirmation and Standing Up for Wilhelm Reich, against a particularly nasty bit of slander in Nature magazine. See the fifth item down on the above webpage. Available for viewing in your browser, or as a PDF download for sharing. 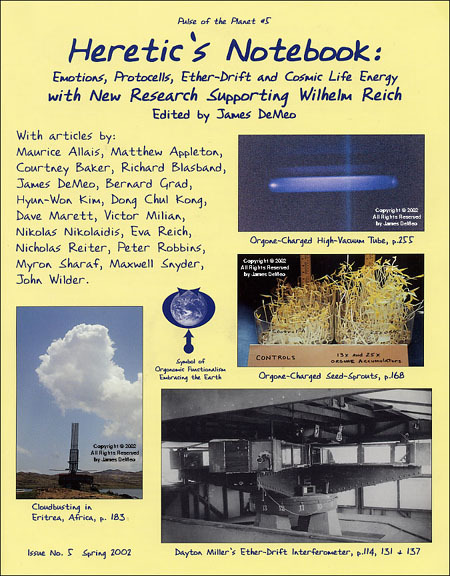 If you are able, please consider making a tax-deductible donation to the Orgone Biophysical Research Lab, which provides support for my work, allowing for such public outreach and educational events, as well as for the scientific research program.